No manufacturing industry that relies on automation can turn a profit without using accurate and reliable sensory equipment. 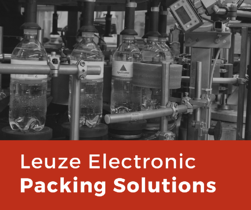 Leuze Electronic has been developing such technology for over 5 decades, and is therefore well-versed with the challenges present in an industrial environment. An extremely basic yet vital application, the primary challenge is detecting high shining surfaces and differentiating between various colors. Leuze’s Reference Reflective Scanner HRTR 46B/L.221-S12 solves these issues and adds surety to the entire packaging line. Once again, the detection of high-shining surfaces and transparent foils poses a challenge. Leuze Electronic’s Retro Reflective Sensors PRK 25B works independent from the used wrap material and provides accurate results. Given that at any particular time only one kind of bottle and cap would be used, the process is extremely daunting as missing caps must be detected safely. Even if the caps are present, they must be totally screwed and be angular. Leuze Electronic’s ODSL 9 measures the analog output and provides a difference in readings in case a cap is missing or improperly screwed. This completely fulfills the customer’s requirements and provides sufficient time for corrective measures to be initiated. Previously, Leuze Electronic recommended RK 18/4G.2 and a special foil for detecting special test bottles in inspection machines. However, test bottles must be detected at all times, while safety should also be at 100%. The solution to this is RKR 18B.1 with Oralite Serie 5400, 5500 & 5700. As a result, a totally tried and tested solution is implemented which allows for safe detection of test bottles and easy handling of the foil. The color and printing position of the markers sometimes vary from box to box. The deviation can sometimes get out of the allowed threshold, leading to consistency errors. Both these solutions have easy installation, and do not overcomplicate the installed hardware. As for the KRTM, more stable performance is achieved, while the KRTL has a longer detection range. Smoke detectors aren’t good at monitoring flour-dust, accurately. The detection of flour-dust over a range of 5 meters is a quite challenging task, especially when the hardware has to be fitted within the conveyer. The PRK 96M/P-1838-41 has been designed and developed specifically for this application, and offers a cheap andd easily implementable solution to an important industrial problem. These are just few of the many solutions Leuze has to offer. The company has already developed solutions for most-frequent problems. However customized sensory problems can also be solved using these initial building blocks, thanks to the modular approach utilized by Leuze Electronic. Interested in learning more about Leuze Electronic's reliable sensory equipment?